On Saturday, House Ag Committee Chairman Mike Conaway (R., Tex.) delivered a speech to the Texas and Southwestern Cattle Raisers at their 2018 Convention in Ft Worth. And on Monday, House Ag Committee Ranking Member Collin Peterson (D., Minn.) was a guest on the Adams on Agriculture radio program. In their respective remarks, both lawmakers discussed Farm Bill issues and the SNAP program. Today’s update includes a summary of the key points made by the top lawmakers on the House Ag Committee. Ron Hays, of The Oklahoma Farm Report, posted an audio recording of Chairman Conaway’s remarks from Saturday’s meeting in Texas; while a FarmPolicyNews transcript of the speech is available here. Chairman Conaway stated, “Farm bill. We’re going to get that baby done. We’ve had a hundred plus, 110 hearings. We did 21 hearings on SNAP alone. Three years of good, hard work looking at what was working, what was not working, how was the ’14 Farm Bill being implemented, and we’re ready to go. “Collin Peterson and I worked well together. He’s a good guy. He’s a friend. And on everything except SNAP I thought we had it going the right direction. He’s got all of his priorities in the bill, I’ve got mine in the bill, the non-SNAP target. And I thought we were working well together on SNAP. To get what we’ve done, as I said, we did 21 hearings over the three years. Focused on policy. Previous attempts to reform SNAP had started with how much money we’re going to cut out of it, particularly in 2013, when we had that aborted attempt at a farm bill there, the idea was just cut money, cut spending, but go find a policy that does that. Well, nothing could be more wrongheaded than that. So instead we’ve spent the last three years looking at policy. 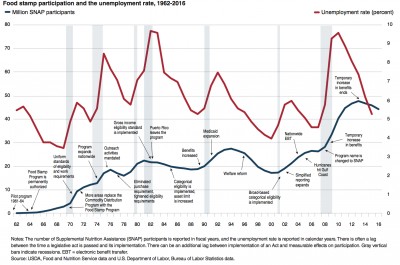 “The five largest food and nutrition assistance programs in FY 2017—the Supplemental Nutrition Assistance Program (SNAP); the National School Lunch Program; the Special Supplemental Nutrition Program for Women, Infants, and Children (WIC); the School Breakfast Program; and the Child and Adult Care Food Program—accounted for 96 percent of total USDA expenditures for domestic food and nutrition assistance. 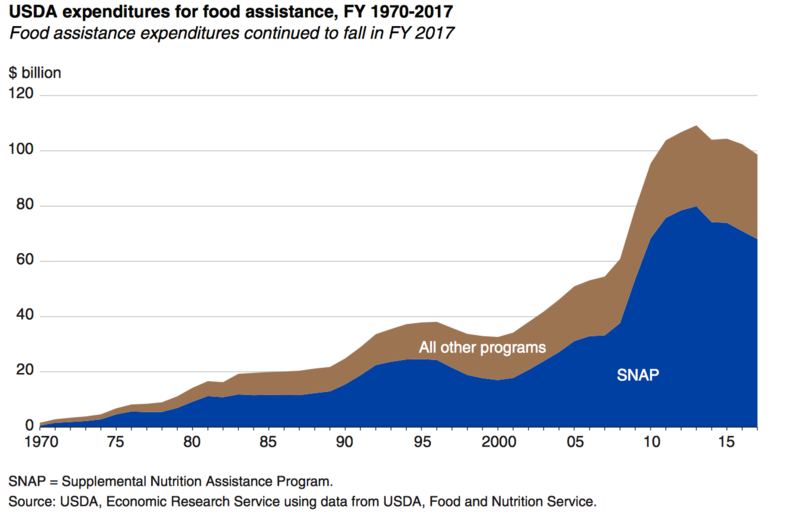 Expenditures fell substantially in FY 2017 for SNAP and WIC but stayed about the same for the other three programs.” The Food Assistance Landscape FY 2017 Annual Report, EIB-190 . USDA, Economic Research Service (March 15, 2018). More specially on SNAP, Chairman Conaway indicated that, “With respect to the SNAP program, that was described by my colleagues across the aisle as ‘extreme partisan policies.’ Keep that in mind. So Peterson and I were working. He had the language on SNAP since February the 7th. He’s had the concepts that we were going to pursue since last October. And I assumed he was working with his members to socialize that within them. He didn’t. He simply told them that Conaway’s just doing what he did in ’13 and we don’t need to be a part of it. “I spent most of March thinking we were negotiating in good faith, and then last week or the week before last his team sent him a letter saying—and I’ve never seen this happen before—but every Democrat on the House Ag Committee sent him a letter saying we don’t trust you to negotiate nutrition, so get off the field. And then last week he sent out a press release that said the House Democrats on the Agriculture Committee are no longer interested in working on the farm bill. They went to the sideline. Those extreme partisan policies are this. We have a bridge or a gap between the unemployed in this country, and the skill set they currently have or don’t have, and all those new jobs that are going to be out there, and the skills that they need to get those jobs. We need a bridge between those. Well, we think SNAP can act as a good bridge. 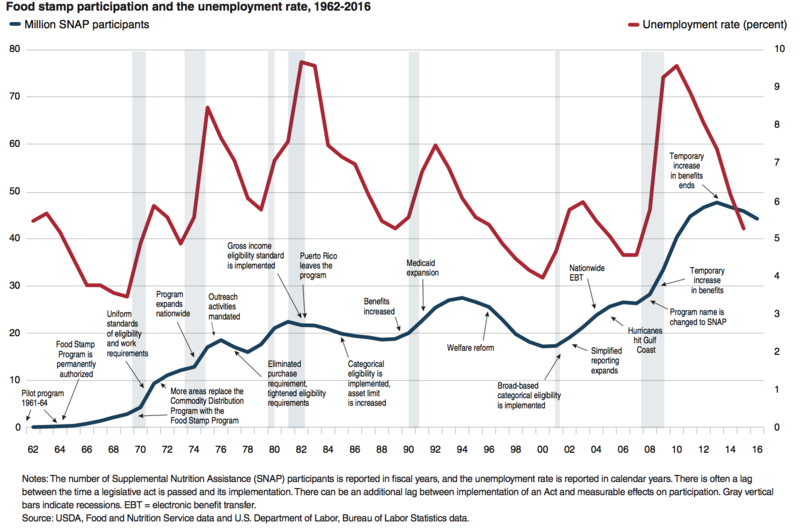 “Design Issues in USDA’s Supplemental Nutrition Assistance Program: Looking Ahead by Looking Back,” by Victor Oliveira, Mark Prell, Laura Tiehen, and David Smallwood. USDA- Economic Research Service, ERR-243 (January 25, 2018). The Texas Republican added, “Now, we’re going to modernize the asset test. We’re going to modernize all those kind of things to try to bring this into the 21st century. Those asset levels haven’t been changed since 1977. We’re going to raise the minimum benefit. We’re going to do some other good things as well. But at its core it says this: if you want to help yourself, then we stand ready to help you. “And it couldn’t come at a better time. This economy is going to get better and better. There are going to be new jobs out there, new opportunities. And that’s what this SNAP program ought to be about. Yep, we’re going to feed you in the meantime, but we want to help you get a job and start moving up that ladder of success. Those are the extreme partisan politics, partisan polices that drove my Democrat friends to the sideline. Shame on them. Rep. Collin Peterson was a guest on Monday’s “Adams on Agriculture” radio program with Mike Adams. An audio replay of their discussion is available here (MP3- 8:00 minutes), and a FarmPolicyNews transcript can be read here. Rep. Peterson stated, “Well, he’s the chairman, and it’s his call. I don’t think it’s a good idea, and I’ve told him that. But it’s up to him. I think there’s no question he can get a bill out of committee, you know, with whatever he wants in it, probably. But how you’re going to get that bill across the floor is a mystery to me. “Having talked to the leadership of the Freedom Caucus, who says even with what is being proposed being in the bill they’re still not going to be in favor of it. That’s about, according to them, about 30 of them. And I’ve talked to a number of moderates, and I think there’s 15 to 20 moderates that won’t vote [with] Republicans and won’t vote for this bill if the SNAP stuff is in there as it currently is. So if that’s true, that’s 50 people, and I don’t know how you pass a bill. Ranking member Collin Peterson says farm bill proposal can pass out of committee but doesn’t think it will pass on House floor. Extension of current bill becoming more likely. Rep. Peterson stated, “Well, it’s not me. It’s not me. This is my members. And my members, you know, initially were upset because I was trying to actually protect the committee and the chairman by not letting this information out because I knew what the reaction was going to be, trying to see if we could soften it, which we weren’t able to do. And finally I had to let them know what the language was, what the score was, and that just made them all the more adamant that they weren’t going to support any bill that had this stuff in it.